As a homeowner, one of the things you want to see in your yard is beautiful and healthy trees. Nothing compares to a landscape with trees that are all thriving and well. 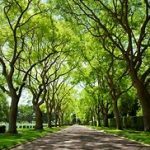 Maintaining the trees in your yard is the secret to keep them stunning and healthy throughout their lifespan, and one of the ways to protect your trees is by taking care of their crown. With an overgrown tree crown, the tree will not get enough sunlight and air that are necessary to keep its health. The crown of the tree can also be an indicator of the overall stress the tree is under. If you look and assess the leaves and branches of the tree, you can have an idea whether it has issues with getting enough nutrients, insect infestations, or diseases. Here are some of the ways you can protect your trees from disease and damage. If you want to keep your tree healthy, you should start with its roots. A lot of homeowners don’t even know the type of soil they have in their yards. What they don’t know is that it is one of the most critical factors in tree maintenance. A tree that is not receiving enough nutrients, the leaves and its flowers will wilt and will eventually die. To find out the type of soil you have in your yard, it is always a good idea to have your soil tested. You will be aware of any issues, or imbalances the soil has that can cause problems for your tree’s health. Get in touch with a certified arborist to assist you in testing your soil. An overgrown crown can lead to health issues on your trees. To avoid having an uneven or overgrown crown, have a regular pruning schedule with a certified arborist. There are different techniques and timing for trimming specific types of trees. You may not be aware of these things; that is why it is best to seek help from the experts. 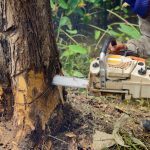 Certified arborists have the knowledge as well as the right equipment for tree trimming that will ensure positive results on the growth of your trees. If pruning is not done correctly, it can cause serious harm to the tree that may be the reason for its death. No tree species is immune to pests and diseases. If your tree gets exposed to fungi or diseases, you can expect its health to decline. To prevent your trees from suffering from insect infestation and other diseases, have them regularly inspected by an arborist. The arborist will look for signs of health issues such as insect eggs, mushroom growth, as well as broken bark. It is recommended to have a professional tree company visit your yard once a year to ensure your trees are in good shape. If there is a problem with your tree, the arborist can treat it before the problem worsens. Before you get that chainsaw and start cutting that tree off, hear me out first. This may come to you as a surprise, but just because your tree seems unhealthy doesn’t mean it needs to be removed entirely. Sometimes, removal is not the answer to restore the beauty of your landscape, but pruning. The truth is, tree removal is the least of our options when it comes to tree maintenance, but if the situation calls for it, we will be more than willing to do it for you. We all know how important trees us for our environment as well as the people and wildlife that benefit from it. They not only add to the beauty of a property, but also offer natural cooling, prevent soil from eroding, and add value to your home. Before asking a tree expert to remove that precious tree, consider these points first to help you get to a sound decision. Your tree may have some health issues, but it can still thrive for many years depending on the gravity of the problem. If 50% of the tree is in decline, we will most likely recommend it to be eliminated. If it is not posing a risk of falling off your house, then we can suggest for it to die in its place. Tree removal can be quite expensive, so if you are on a tight budget, you can let it stay in your yard, especially if it is not a safety hazard at all. It also pays to check where the damage is located before deciding to remove it. If the injury is not more than 25% of the trunk’s circumference, there may be no need to remove it and allow it to heal on its own. Dying or dead branches can be trimmed to permit the tree to recuperate. Vertical cracks, seams, and dead branch stubs are indications of damage in the internal trunk. Large broken limbs can be dangerous and should be assessed immediately. If 25% of the branches are dead, then it is more likely that the tree will recover. Routine pruning can prevent issues like this from occurring so that the tree can live its full lifespan. If you had your tree under bracing and cabling to prepare for the cold weather, it could cause the tree to fall because of the added weight. Where are the dead branches mostly seen? Check where most dead branches are located. If they are on one side, it can mean that the tree has a problem with its root structure on that particular side. It can result in the tree becoming lopsided. Leaning trees can pose severe damage to your property because they can fall off during high winds and intense storms. Trees in this situation are more likely to be removed by a tree professional. Is there a presence of a large fungus on the trunk? It is normal for mushrooms to grow at the base of the tree. However, if they are growing on the trunk of the tree, you should have them inspected by a tree professional right away because it can be an indication of internal rot. Is your tree growing near power lines? Trees should not grow close any fixed structure especially, power lines. Regular tree trimming will help a lot in keeping this from happening. Never attempt to do this type of job because it can cost your life. Always ask the professionals to do this risky job for you. Have you checked with a professional? Tree maintenance can be challenging especially if you don’t know how to do it properly. Let a professional tree service company inspect your trees regularly to avoid them from causing damage during an intense storm or high winds. A certified arborist will be able to tell you exactly what needs to be done to your tree, whether it can still be saved through pruning or if it needs to be removed. A good tree expert will always work in favor of restoring the health of the tree more than removing it. But if removing the tree is the smart way to deal with the situation, a tree expert will be able to tell you so. Tree felling is a job that one can do by himself. All that is required is proper planning, ensuring safety, adhering to rules and regulations and a chainsaw. Before starting tree felling always remember to get a permit as some areas are strict as far as tree felling is concerned. Below are the do it yourself tree removal tips that should be adhered to when going about tree felling. Prepare to cut down the tree. Safety should always come first, take a look at the area surrounding the tree while taking considerations of objects such as houses, power lines, fences and other structures that might be in the tree’s vicinity. Proceed on the task if the tree falling zone is safe if otherwise, call a professional to do the job. In case of power lines in the zone alert the supply authority to put them off. Decide on the direction to fell the tree. The direction of the wind and the direction in which the tree leans should always be the main factors in determining the direction of felling the tree. If the tree leans in a direction with obstacles always contact a professional to do the work. In windy areas consider felling the tree in the direction of the wind. Once you’ve ensured that the tree fell zone is safe, it’s now time to get down to business. Below is the procedure to follow when cutting the tree. Point the chain saw in the direction you want the tree to fall. Using the sights on top of the chainsaw make a 60 degrees angle cut in the tree’s trunk, saw the trunk to a depth of about 20-25% of the tree’s diameter. You should then make another cut now horizontal to the trunk in the same direction to meet the top cut so that you now have a notch curve which faces in the tree fell direction. At this stage, you should ensure no people or animals are in the radius of the tree felling zone. Saw a horizontal cut a few inches above and in the opposite direction of the notch curve. Then stop cutting a few inches before reaching the directional notch, this will create a hinge that will enable the tree to fall controllably. You should then use a felling wedge as a lever so as to make the tree to begin to fall. Lastly, retreat and watch as the tree falls. Ensure you aren’t in the direction of fall. If DIY tree removal is not for you, don’t hesitate to call Virginia Beach Tree Service. 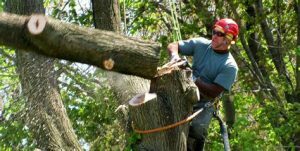 They offer complete tree care services to include professional yet affordable tree removal service.